Beeswax! That enigmatic by-product from the production of honey - honey being a premiere substance produced for our gastronomic delight. Beeswax is comprised of over 300 compounds, some of which only a honey bee can synthesize. Also, beeswax has never been successfully reproduced in a chemical lab! Amazing! Besides just smelling wonderful and being the substance of the very best candles made, it produces its own bloom, and burning for many hours, beeswax has yet another amazing attribute. If we are to think about it for a moment, we never see a picture of a beehive with melted wax pouring to the outside of the hive in the summertime when it is hot. That is because natural beeswax has a higher melting point than other candle waxes, primarily because of the gums and resins the bee includes in it. Therefore, free-standing beeswax is quite tolerant to summertime heat. The picture above shows an experiment we conducted on a sizzling hot August day in Lynchburg, Virginia in the summer of 2005. You can try this at home, just be sure you secure the candle in the holder of your choice, hopefully metal or glass. We used a light colored wax (Cream), a medium colored wax (Sunset Orange), and a dark wax (Night Horizon), because dark colors absorb heat more than light colors do. All of the candles were regular tapers. The one "pencil thin" is the very thin red candle to the right, while the Butterscotch wax in the middle back is the softest of the natural waxes. The candles were put in place at 9 AM when the temperature was already in the mid 90's. The picture shown was taken at 1 PM with the ambient temperature well over 110°. (All temperatures are Fahrenheit.) While beeswax is not impervious to heat (do not leave candles in your car with the windows rolled up in the summertime! 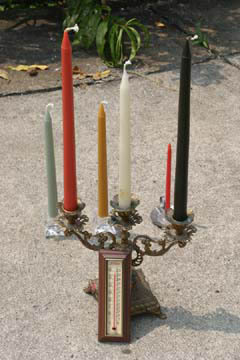 ), you can be assured that your candles will consistently maintain their shape during a hot summer in your home.